You may receive plants that are actively growing or plants that are dormant. Dormancy is part of a perennial&#x27;s life cycle. Due to shipping, some leaves may appear yellow. They will be fine with proper care. <br/> <br/>Your plants will arrive potted, bare root, or in some cases root-wrapped (unpotted). You will need to treat these forms of plants slightly differently when unpacking. 1. Upon arrival, remove the plants from the shipping box. Remove the plastic bags. 2. Water your plants thoroughly if the soil is dry to the touch. Soil should be moist, but not soggy. 3. Plant as soon as possible. If you are unable to plant them right away, place the plants in a shady location and check the soil moisture daily. Keep the soil in the pot moist, but not soggy. Plant no later than 7-10 days after receipt. 1. Remove the plants from the shipping box or container you purchased it in. 2. Inspect the plants for healthy crowns and roots. Unwrap bare-root plants and soak their roots in water for one hour. 3. Plant as soon as possible. If you are unable to plant right away, rewrap them in the original packing material or in moist peat moss. Keep them at a temperature of 35-40° F or in the refrigerator. Do not freeze. Avoid damaging the roots and do not allow them to dry out. Plant no later than 7-10 days after receipt. 1. Upon arrival, remove the plants from the box. 2. Check your packing list carefully to ensure all items have been received. 3. Unwrap the vines and soak their roots in water for one hour. 4. Plant as soon as possible. If unable to plant your vines right away, you will need to plant them temporarily in containers in potting soil. Do not allow the roots to be damaged or dry out. 1. Upon arrival, remove the packaging material from the plant. 2. Plant as soon as possible. To store temporarily, plant in containers with potting soil. Do not allow roots to dry out. Plant within 7 days of receipt. 1. If temperatures are above freezing, set the plants outside in a shaded, sheltered location for a few hours on the first day and then bring them inside. 2. Each day, gradually increase the plant's time outside and its exposure to sunlight and wind. 3. After several days of gradually increasing daytime exposures, leave the plant outside overnight as long as freezing temperatures are not expected. (If freezing temperatures are expected, bring the plant in for the night only.) After 10-14 days of hardening, the plant will be ready to plant in the garden or to live on the patio in a container. 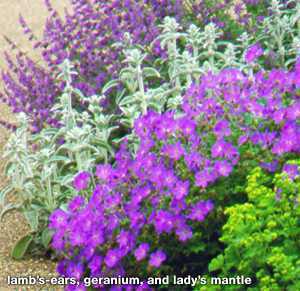 Due to cold winters and short winter days, perennial plants go into a state of winter rest. These sleeping plants are dormant, not dead, and will wake up and begin their spring growth cycle as day and night temperatures warm and days lengthen. Certain perennials are very late to wake from dormancy; these include Ceratostigma plumbaginoides, Echinacea purpurea, Platycodon, Helianthus maximiliana, Coreopsis "Moonbeam" and "Zagreb", Oenothera missouriensis, Perovskia (Russian Sage) and others. Avoid over-watering dormant plants; a good soaking at planting time is usually enough until the plant begins to awaken and grow.